Facebook boasts approximately 2.07 billion monthly active users and 1.37 billion daily active users. As the third most trafficked website in the world, Facebook is the leading social network for B2B and B2C businesses to use to reach their customers. In this guide, you’ll find everything you need to know about Facebook to get the most out of it for your business, from organic to paid Facebook marketing. 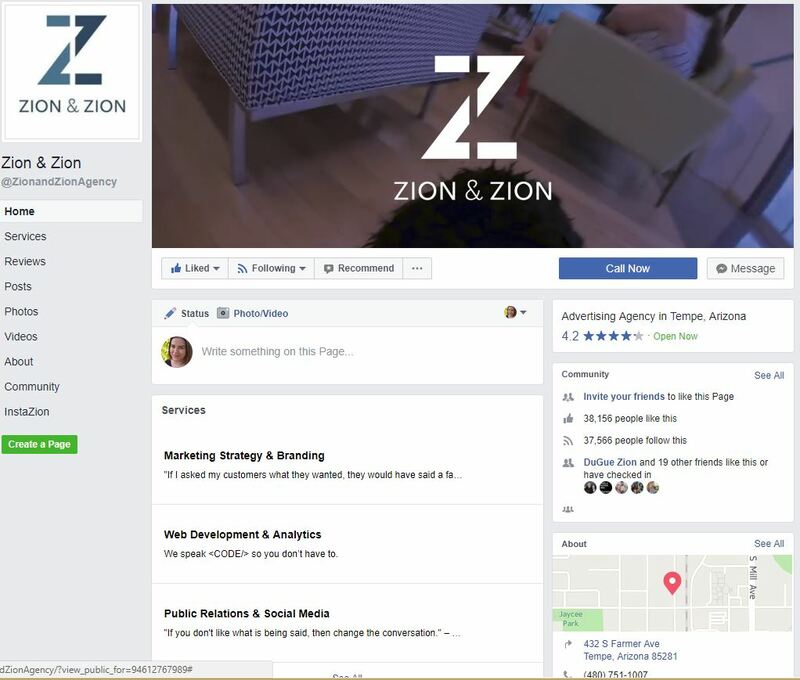 As a full-service agency with a large social media department, Zion & Zion is constantly keeping up with the latest changes regarding Facebook so that you don’t have to. Facebook has a long list of terms that you need to know in order to keep up with various aspects of your marketing strategy. Here’s a breakdown of the main essentials. The people who create and manage Facebook pages and groups. The large 820 x 312px image or video at the top of your Facebook page. When someone Likes a Facebook page, they become a fan. When someone Follows a Facebook page or personal profile, they become a follower. The ability for people to follow public posts from personal profiles or business pages on Facebook. The ability to ‘Like’ applies to becoming a fan of a Facebook page and giving positive feedback to a post on a profile, group, or page. Facebook pages can turn on a feature that allows people to send them private messages. Facebook users can view updates from people, pages, and groups on their News Feed. Facebook’s algorithm favors updates from people and groups first, then pages. Alerts you receive when someone engages with posts you’ve published on your Facebook page. Fans of your page can also sign up for notifications to get alerts when you publish a post to your page. An alternative to a ‘Like,’ users can leave a Love, Wow, Haha, Sad or Angry reaction to your post to show their feedback. 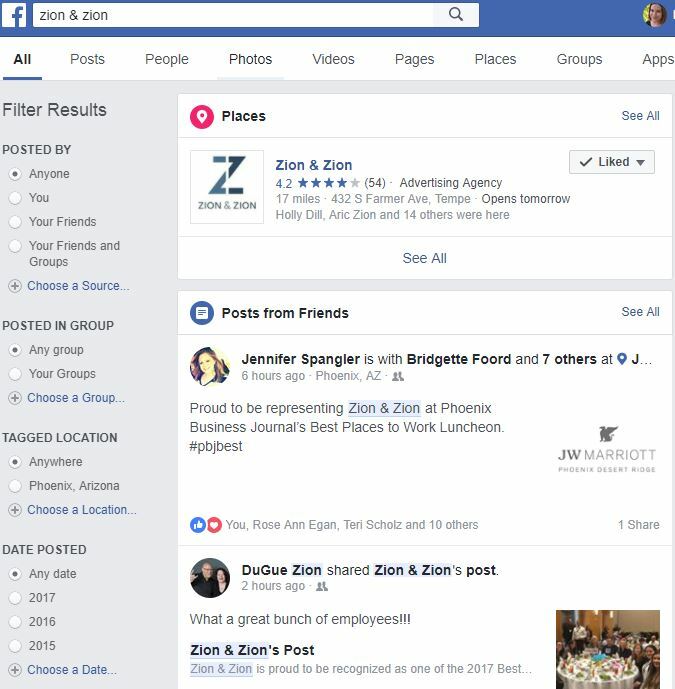 Facebook users can tag people and pages in their posts. Celebrities, global brands, media, and other public figures and pages can have their business page verified by Facebook to help users ensure it represents the actual entity. When someone visits your Facebook page on their desktop browser, they’ll see the following. On a mobile device, they’ll see even less. Based on first impressions, here are the most important elements of your Facebook page, depending on how you have your layout organized. The 820 x 312px cover photo or video for your Facebook page receives the most attention for desktop and mobile visitors. 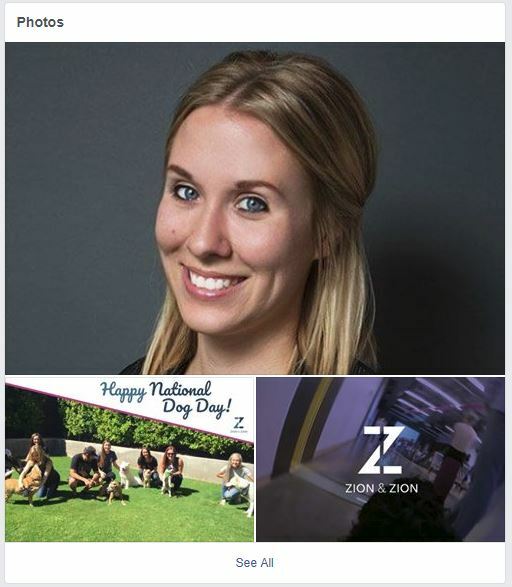 You can use your cover photo or video to highlight your best or newest products and services, events, and much more. When you add your cover, be sure to edit the description to include a link. 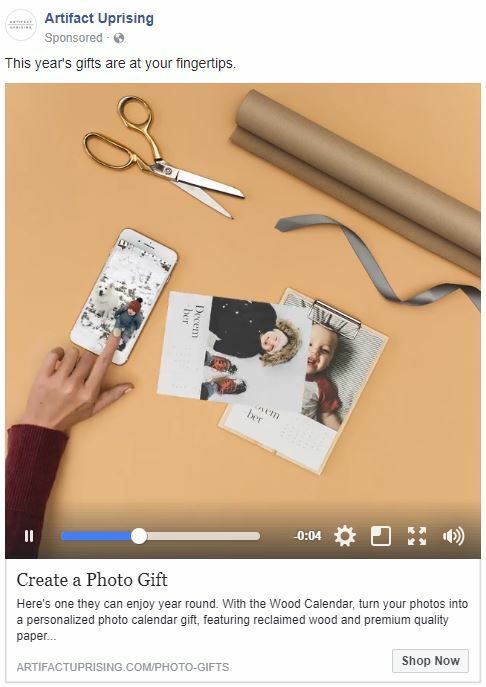 That way, when people click on your cover photo or video to learn more, they’ll be directed straight to a relevant landing page on your website. 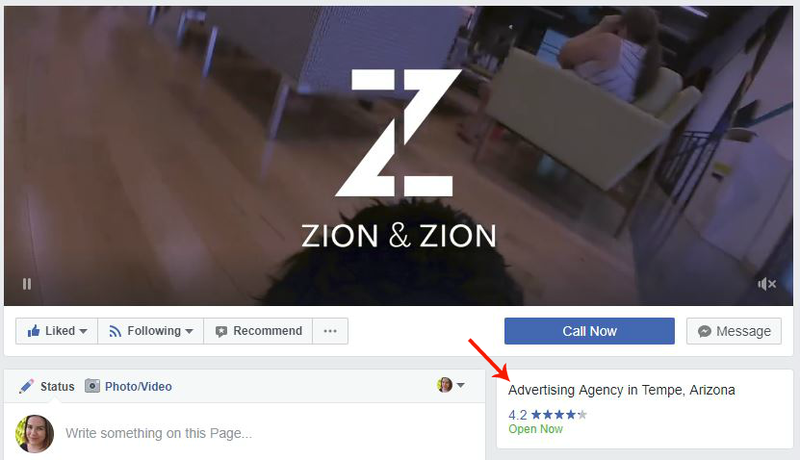 On desktop, beneath your business’ call to action button and above your review rating, you’ll find the category for your Facebook page. Choose yours wisely, especially if your business doesn’t have a literal name (i.e. Barro’s Pizza is obviously a pizza restaurant, however it is not obvious that Zion & Zion is an advertising agency by simply reading the name). That way, visitors on a desktop or mobile device can quickly know what your business has to offer. This image should be consistent with the rest of your social media profiles. That way, if someone is a follower of your business on Twitter, they’ll be able to easily recognize your Facebook page based on the matching profile picture. We almost always recommend using your business’ logo as your profile picture. 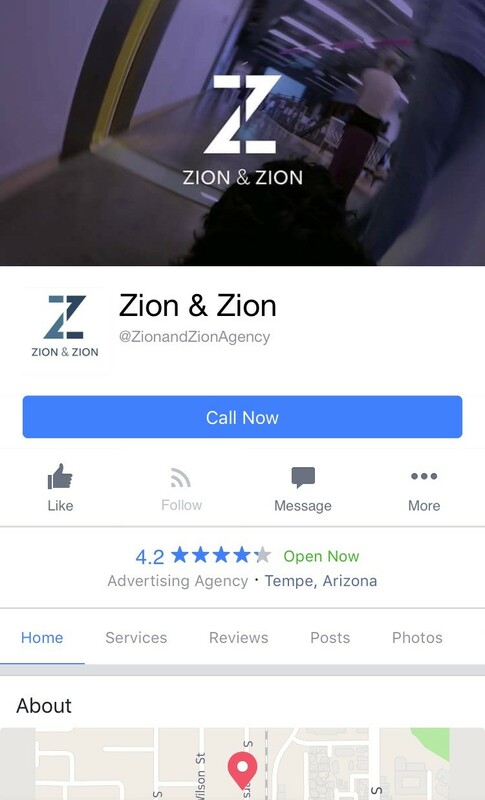 If you’re a business and have the reviews tab enabled, your star rating has a prominent spot on both mobile and desktop versions of your Facebook page. Be sure to encourage fans to leave reviews on your page so you can boost your star rating! This will appear both on your page itself, and within Facebook local search results. 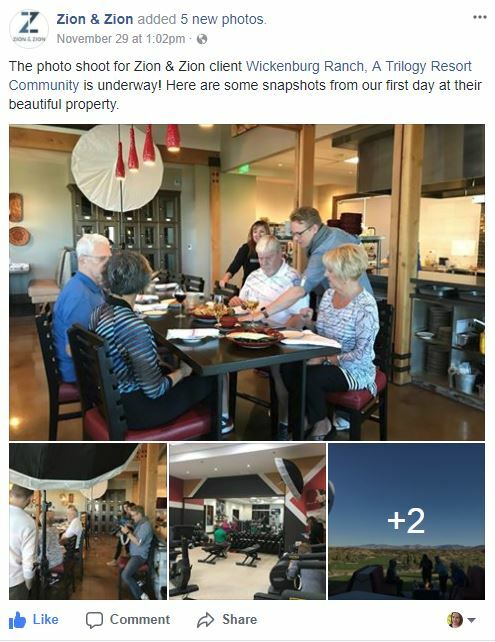 For local Facebook pages, the About box appears on the right sidebar beneath the Community box. The About box shows your location on a map, address, phone number, website URL, category, and hours. Depending on your page type, be sure to fill out these pieces of information. 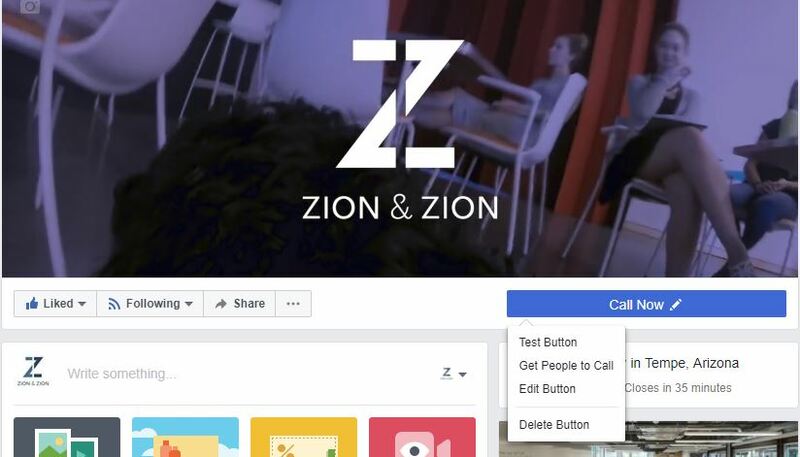 On the upper toolbar, there’s an option for Facebook business pages to set up a call-to-action (CTA) button. Depending on your business’ goals, you can direct users to order food, book services, get in touch with a representative, learn more, make a purchase or donation, or download an app or game. Remember to track how often this button is clicked in your Facebook Insights. In the vertical menu bar beneath your profile picture and name, your page has links to your timeline, about section, photos, videos, and community page, corresponding to the layout of your overall page. Custom apps like contact forms, newsletter sign up forms, and others can be added to this navigation. If you’re interested in adding custom apps, services like Pagemodo, AgoraPulse, ShortStack, WooBox, TabSite, TabFusion, and Heyo are great help. Facebook posts are the bread and butter of your page and are displayed in descending order. To make a good first impression, you’ll want to make sure your Facebook page regularly publishes posts. New Facebook pages should have five to ten posts on their wall before they attempt to build their fanbase. If you would like a specific post to appear at the top of your post section, use the option to pin a post to the top of the page. However, be sure that this post is unpinned if it’s old information, a past event, or has been pinned for a long time. Visitors may not realize you have newer updates beneath it and leave your page thinking it’s inactive. On your page, visitors will find boxes for the photos you share in posts and the videos you add directly to your page. In the left sidebar, visitors will find a Community tab. This is a hub for visitor posts and check-ins, in addition to public posts that your page has been tagged in. 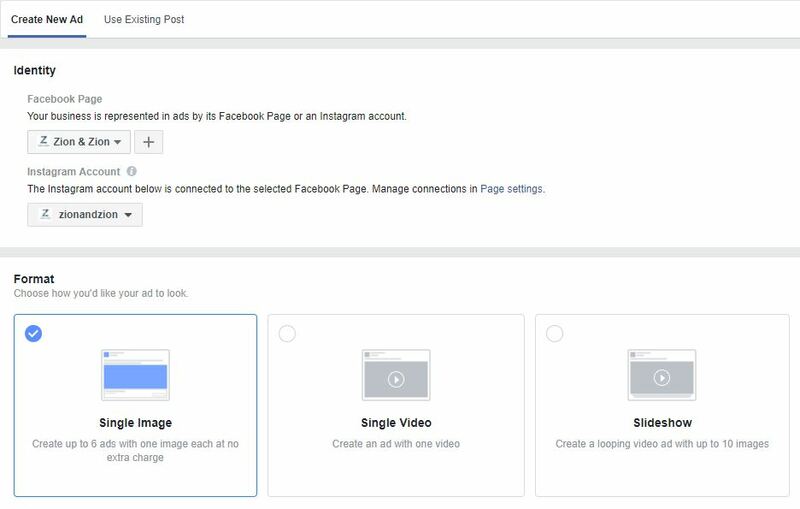 You can configure your settings to allow people to post to your page, make all posts reviewable before they go public, or not allow people to post to your page in your general page settings. One major issue with Facebook is reach. 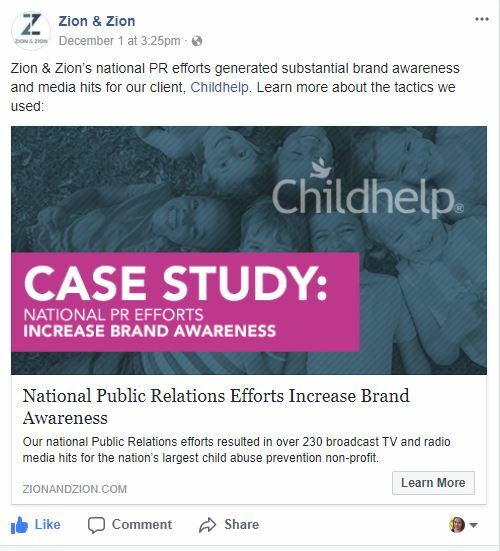 For the last couple of years, Facebook has continued to lower the organic reach that Facebook pages get with their updates and are lowering the reach even further on what they consider “promotional” posts. 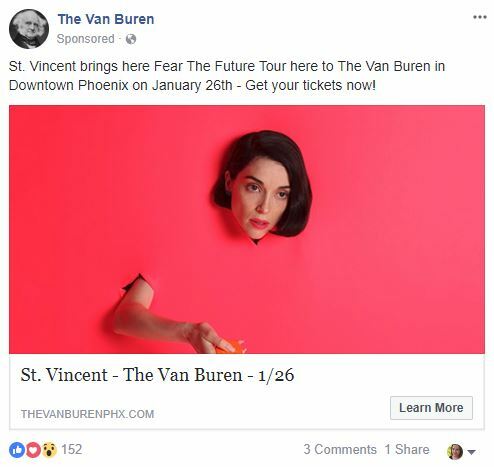 If you’re planning to post something to your page that’s considered by Facebook to be promotional, you’ll need to consider utilizing Facebook advertising, which we’ll discuss later in this guide. Just like any other aspect of your online marketing, you should carefully plan your Facebook page marketing strategy. To be successful, you should consider these tactics. Once you’ve set up the perfect Facebook page, you’ll want to start growing your fanbase. Here are some ways to get relevant fans for your Facebook page. 1. Add the Page Plugin or Like Button to your website. Both allow visitors on your website to Like your page in just one click without having to leave your website. 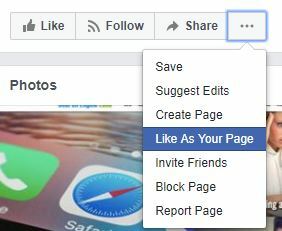 The Page Plugin allows you to display your latest Facebook page posts along with faces of your fans, whereas the Like Button simply gives visitors a button to click to Like your page. 2. Use your personal profile to invite your friends to Like your page. This approach works best with friends who are already familiar with your business or those who are happy to support all your endeavors. 5. Include a link to your Facebook page in your email signature. Services like WiseStamp allow you to create a professional email signature that includes your social links. 6. Include a link to your Facebook page in your business newsletter. 7. Include your Facebook page link or username on your business card. 8. Embed Facebook posts on your website. 9. Tag other Facebook pages or users. Keeping your Facebook page up-to-date is important for two reasons. First, when visitors come to your Facebook page, activity will encourage them to Like your page. It may even encourage them to do business with you if your competitor is not so active, as a non-active Facebook page sometimes translates as a non-active business. Second, the more you post, the more engagement you receive. And the more engagement you receive, the more visibility you will gain with your fans. Facebook allows you to post different types of updates to your Facebook page. These types include the following. 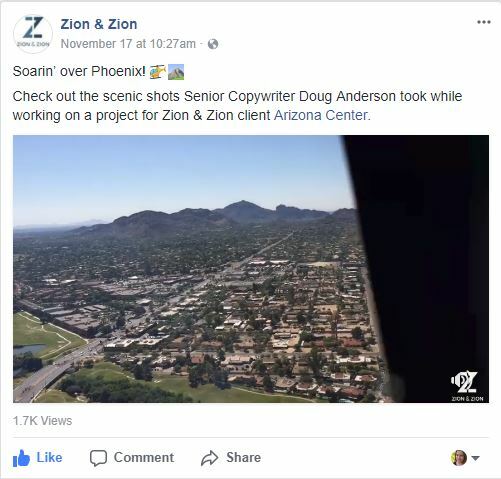 A post with a link will include text, a link, a link preview that includes a thumbnail from the linked page, a description of the page, and a headline. With this, you can include multiple photos to create a photo carousel. A post with that includes a photo or multiple photos. Additional text and links are optional. A post that includes a video that has been uploaded on Facebook. 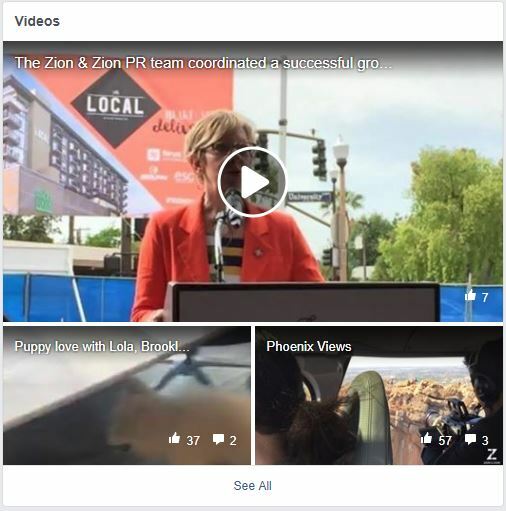 Videos uploaded directly on Facebook will show a view count and will play automatically in the newsfeed. They typically also have a larger reach. With this, remember that you can go live on Facebook or create a photo slideshow as an easy-to-create video alternative. A post that is text only without links, photos, or videos. 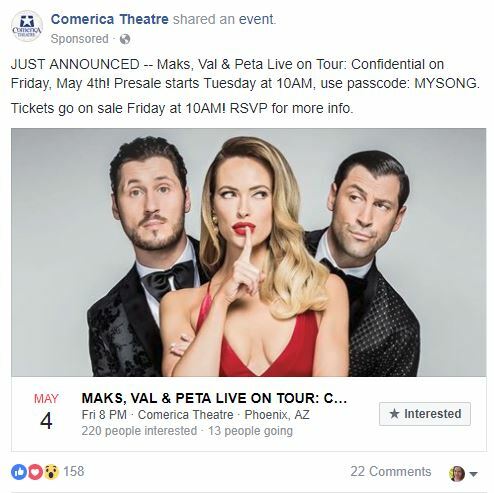 A post that is specifically configured to promote an event that’s set up on your Facebook page. A post that is specifically used to celebrate a major achievement, such as opening your business, launching your franchise, or simply reaching your 10,000th fan. 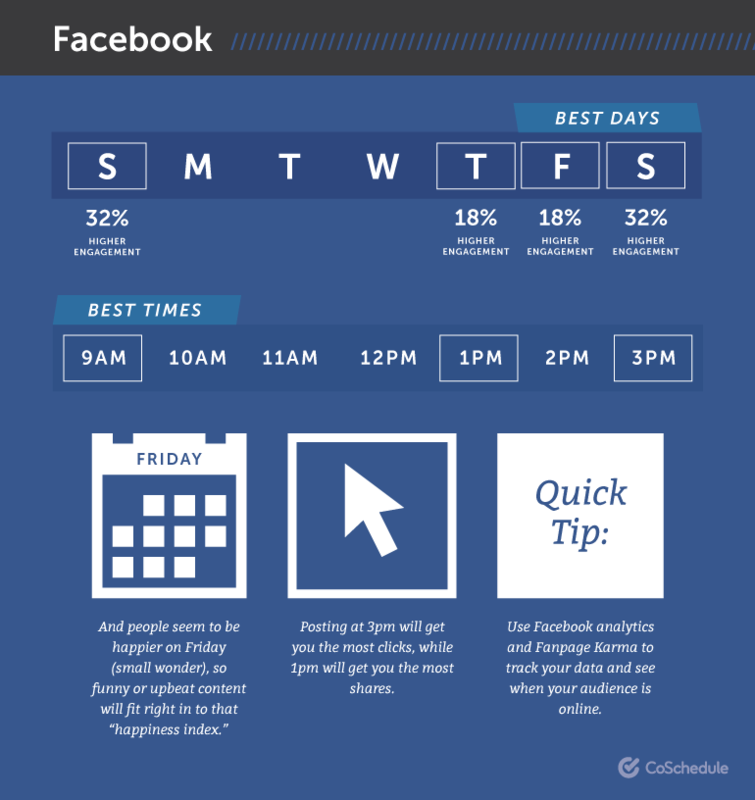 According to CoSchedule, these are the best times to post on Facebook for the most shares and clicks. Of course, the same days and times will not work for every business. Your best bet is to post at multiple times per day for a couple of weeks and then try Fanpage Karma. This tool will analyze your Facebook posts and determine the best times to post for maximum engagement. 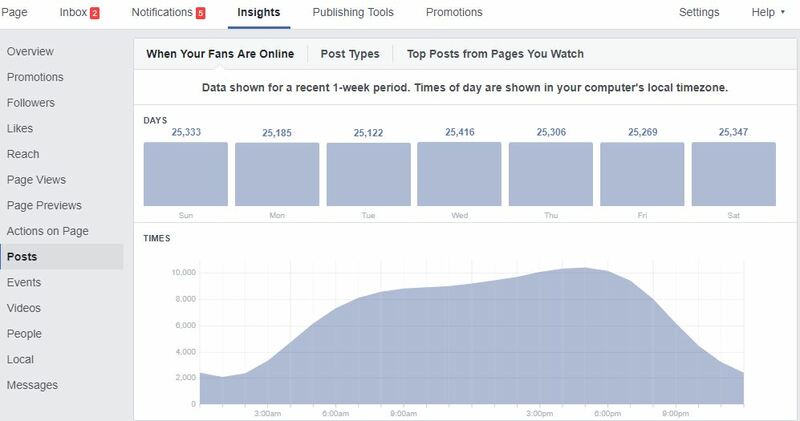 You can also find out when your fans are online inside your Facebook page’s Insights. Unlike Twitter, Facebook is much more difficult to monitor when it comes to your brand. 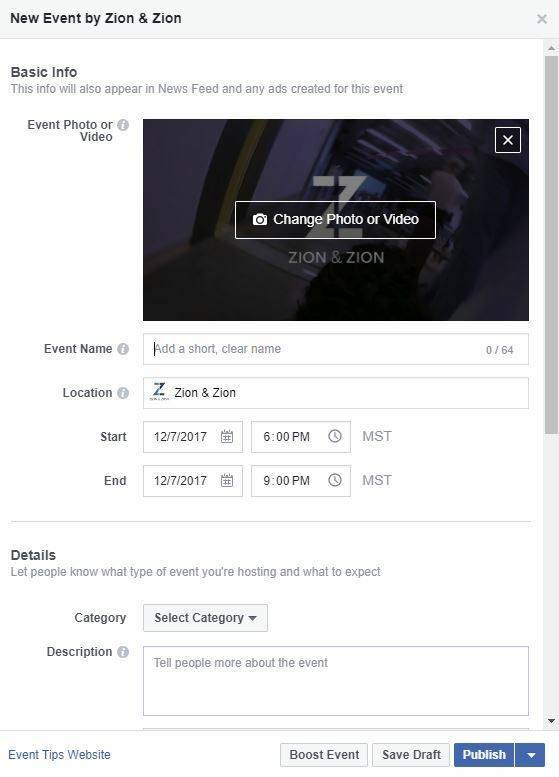 Facebook’s main search engine allows you to filter your search by who the mention was posted by, in which group, in which location, and on what date. One thing you can look for, in addition to mentions of your business, are pages and groups about your business, but not owned by it. This search is especially important for businesses that might have a reputation management issue to contend with. Join unofficial business groups to interact with users and provide customer service. Speaking of customer service, if you have a Facebook page, you’ll want to monitor it constantly for customer service opportunities. Depending on your pages’ settings, people can send you private messages, post directly to your page, leave reviews, and comment on your posts. Be sure to actively respond to inquiries and comments that people make. Using Facebook as your page, you can Like other pages in your industry where your customers are most likely to be engaged. SEO companies, for example, can Like Search Engine Land’s Facebook page as their page and help people who ask questions on Search Engine Land’s page. If you allow people to post to your Facebook page, public posts and reviews can be utilized as testimonials and embedded on your website. 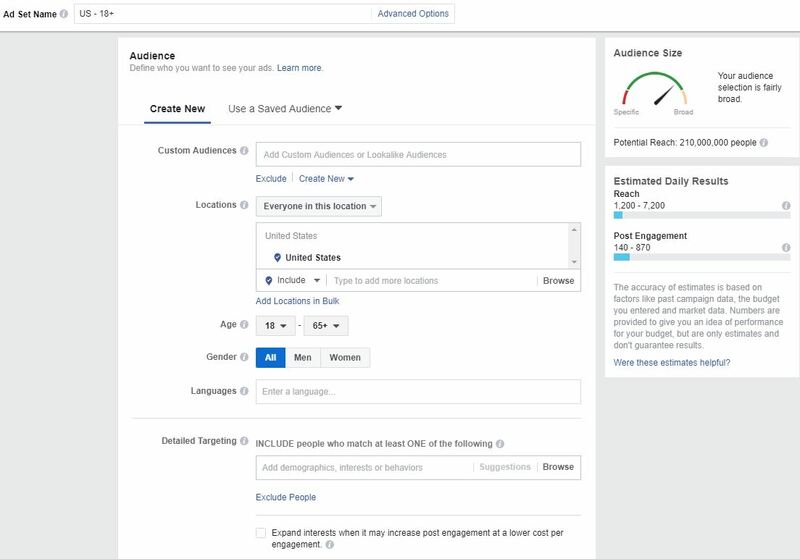 Facebook allows you to create ads based on your campaign goals. These goals include the following. Increase the number of users for your app. Reach users that are more likely to pay attention to your ads to increase brand awareness. Get people to click through to a page on your website with the intent of completing a goal, such as making a purchase. Can be in the form of post engagement, page Likes, or event responses. Collect information from people interested in your business. Get people to message your business on Facebook. Ads that show products from your product catalog based on your target audience. Get users to click through to a page on your website. Increase views for videos uploaded directly to Facebook on your page. 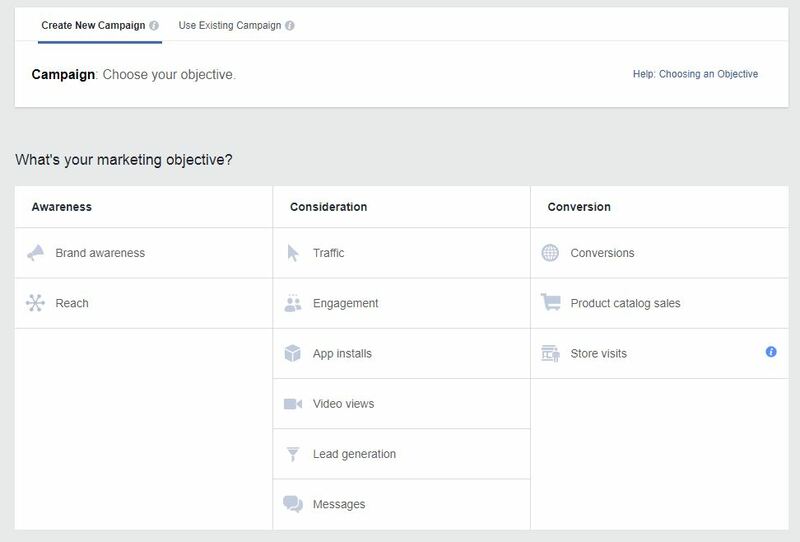 Follow these steps to create an ad campaign on Facebook. 1. Visit the Advertise on Facebook page and select your ad campaign objective. 2. Target your ad campaign to a relevant audience that’s most likely to complete your ad campaign objective. If you want to create remarketing ads for visitors to your website or target your ad campaign to custom lists of users, visit the Audience Manager prior to your ad campaign to create custom audiences. 3. Customize your ad’s duration, campaign budget, and goals. 4. Depending on your objective, create a new ad or use an existing page post. 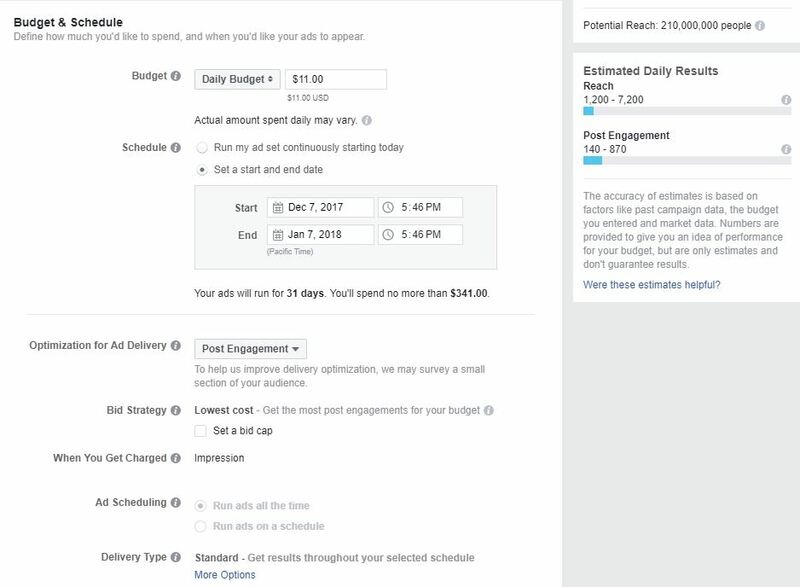 Once Facebook approves your ad, it’ll begin running immediately, or at the time you have scheduled. 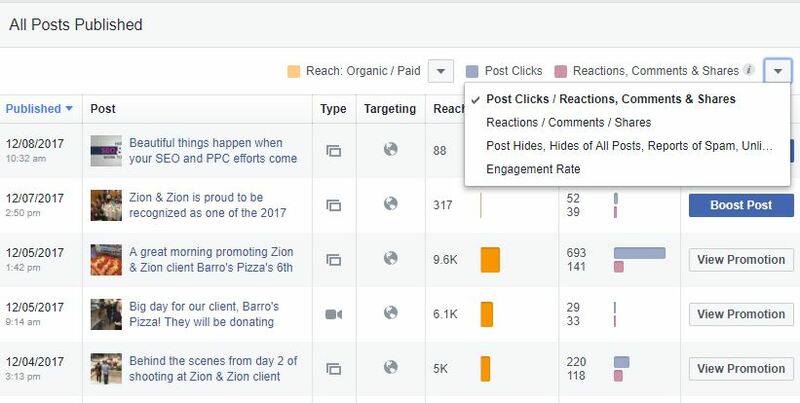 Be sure to visit your Facebook ads dashboard to review analytics related to your campaign. 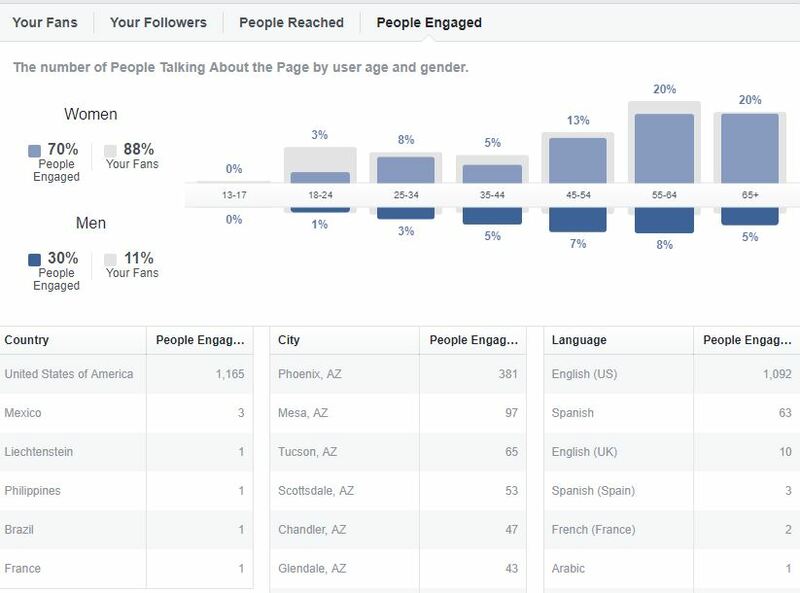 Insights will give you an in-depth look at your Facebook pages’ analytics. It covers the overall engagement for your page as well as detailed data about each of your pages’ posts. Some interesting insights to review include the following. In addition to seeing how your audience is growing, you’ll need to keep an eye on its health overall. The Net Likes graph shows paid and organic Likes along with Unlikes. Want to know which post types get the most engagement? Try the Post Types chart. 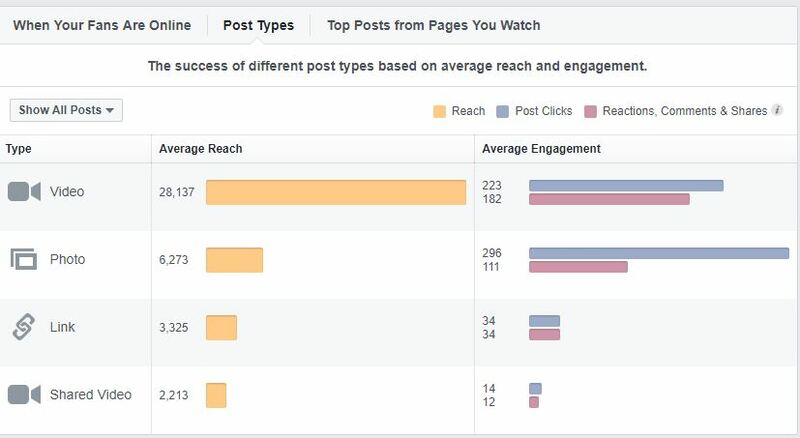 The All Posts Published table shows how well each of your Facebook posts has been received by your audience. Use the dropdown at the top right of this table to dive deeper into engagement analytics, including any negative feedback (hides, spam reports, and unlikes). While the demographics for your fans are important, demographics for the people who actually engage with your posts are even more important. 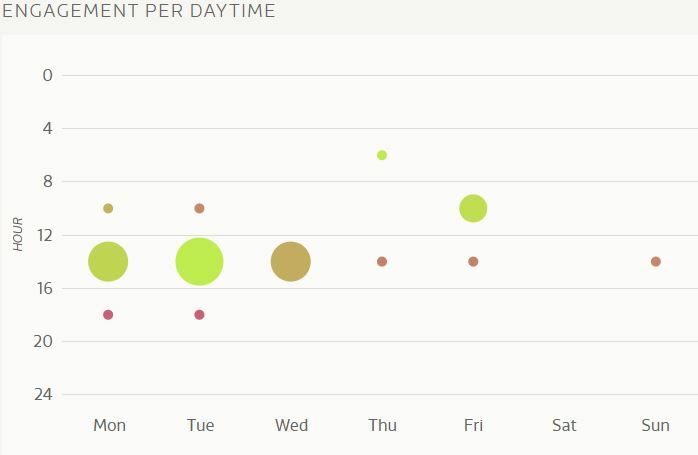 Use this data to determine who’s interacting with your pages’ updates. 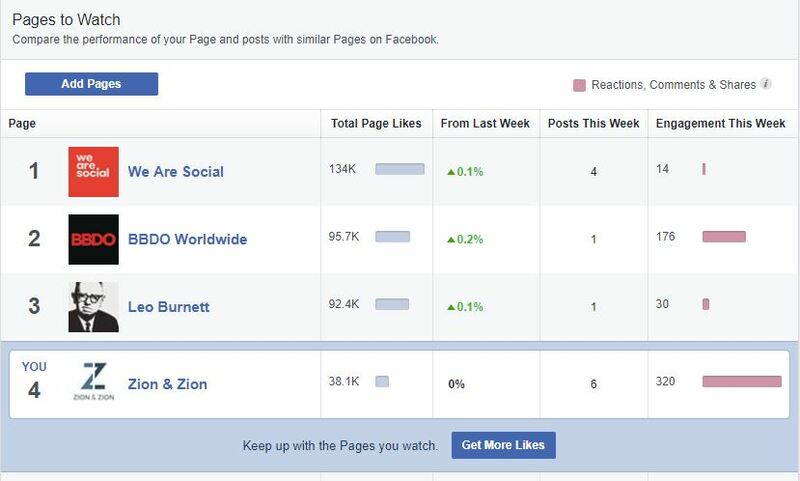 This is a great feature for benchmarking your Facebook page to your competitors. Add your competitor’s Facebook pages to see where you stack up. 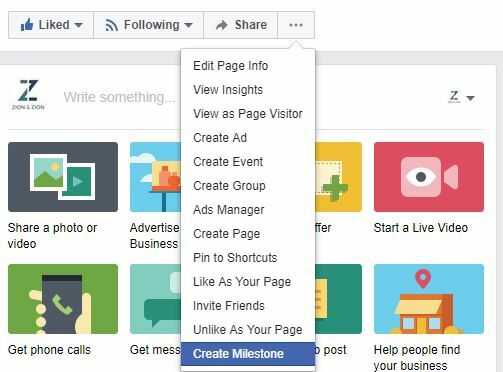 Although you can manage your Facebook page solely using the Facebook platform, Facebook tools can help make the process smoother. The following are popular tools businesses can use to manage specific aspects of their Facebook marketing. AgoraPulse is a social media management tool that includes powerful Facebook apps, competitor monitoring, and publishing features. Buffer allows you to create a schedule of when you want to send updates to your Facebook page (along with Twitter, LinkedIn, Instagram, Pinterest, and Google+). When you add updates to your Buffer, Buffer sends them out at the next available times on the schedule you created. This will help you set up your Facebook page posts for the next day, week, month, etc. at once, so you can focus on engaging with other Facebook users. 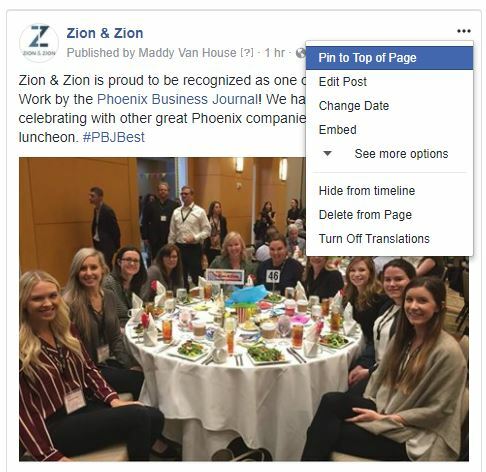 HootSuite is a publishing tool that allows you to send and schedule updates to your Facebook page (along with Twitter, LinkedIn, Instagram, and Google+). IFTTT allows you to set up automations for your Facebook account. For example, when someone tweets a link from your website, you may want to tweet a thank you to them. IFTTT allows you to do that and much more. Zapier is a similar premium service that allows you to automate Facebook activity on a more detailed level, in conjunction with more business-specific applications. 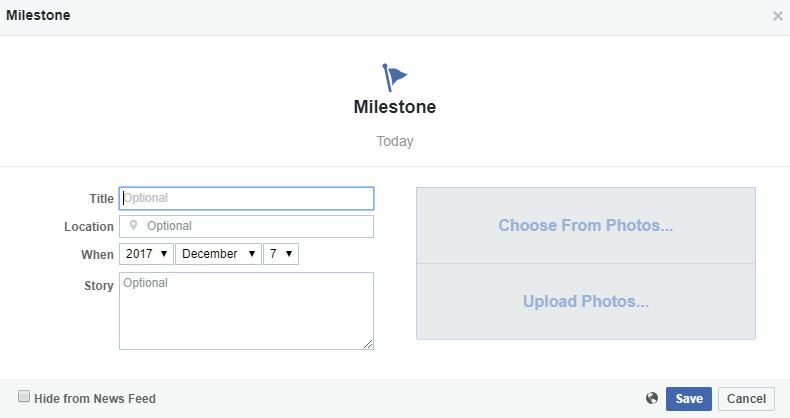 Post Planner allows you to publish and schedule posts to publish to your Facebook profiles and pages. It also has a built in ‘Trending Content’ feature that helps you find the best content to share based on your audiences’ interests. Rival IQ is a competitor research tool that allows you to monitor your Facebook presence, along with your competitors, to ensure that you’re getting the most of your Facebook marketing in terms of positioning and engagement. SOCi is a great social media management tool for managing multiple businesses and locations. 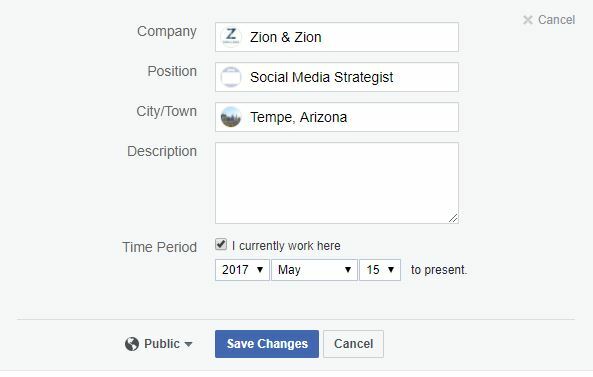 You can schedule content to publish to Facebook, Twitter, Instagram, Google+ and Linkedin. While this is not an exhaustive guide for the world of Facebook, it’s a great starting point. Looking for additional help managing your Facebook business page? Contact us today.